It is fascinating to review the history of this unique educational institution as it was viewed by Alice Louise Reynolds in its 44th year. This brief history is excerpted from the BYU Banyan yearbook of 1920. 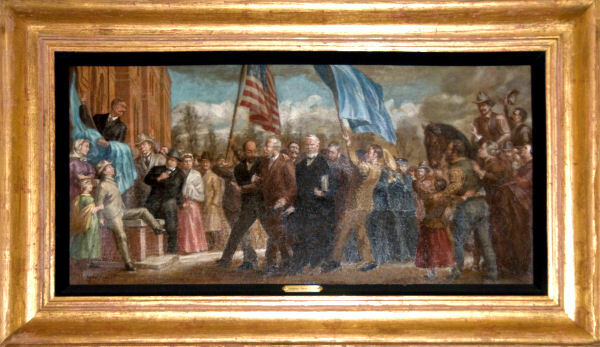 The Brigham Young University and Brigham Young High School, formerly known as the Brigham Young Academy, were founded by a deed of trust executed by President Brigham Young, October 16, 1875. Soon after this date [on January 3, 1876], a brief term of the institution was started by the Hon. 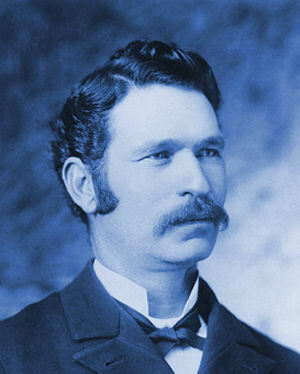 Warren N. Dusenberry, who subsequently resigned to practice law [upon the arrival of the designated new principal]. On that first day twenty-nine students were enrolled, [Reed Smoot being the first], Joseph B. Keeler being the twenty-ninth. The first faculty consisted of teachers Karl G. Maeser, Milton H. Hardy, [John E. Booth] and Anna Kristina Smoot, familiarly known as "Teenie" Smoot. Three persons made up the first graduating class [in 1877], Anna Kristina Smoot, Samuel Moore, and Caroline Ameilia "Caddie" Daniels [later Mills]. Miss Caddie Daniels was the first Normal graduate [one preparing for the profession of teaching] to teach in the school. Miss Teenie Smoot [also a Normal student] came on to the faculty before her graduation. In the hall of the High School building [later known as the Education Building], at the present time , hangs a painting of a square, red brick building enveloped in flames. 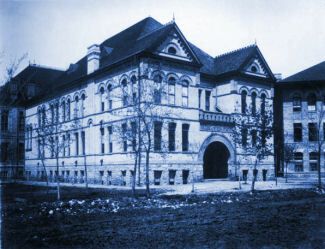 This [Lewis Hall] was the first home of the institution. It occupied the present site of the Farmers and Merchants Bank. It burned to the ground Sunday, January 24, 1884. 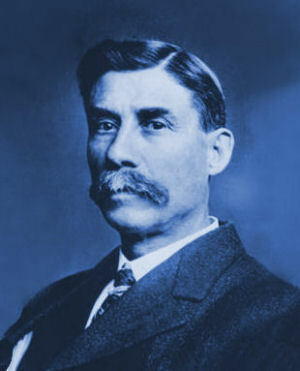 President Charles O. Card of Cache Valley, hearing of the disaster, made a trip to Provo, promising to charter a train and take the students to Logan if they would go. That such a thing was wholly unnecessary was proved by the fact that only one day of school was lost. The basement of the old tabernacle, the A. O. Smoot building, and the S. S. Jones building were hurriedly put into condition and made to furnish temporary quarters for the school. The following year the Z.C.M.I. warehouse was partitioned off and turned into class rooms. Amidst the puffing of engines and the shriek of locomotives, classes were held. Procession to new campus in 1892. In January 1892, the students took the long trail up University Avenue [then Academy Avenue], led by Dr. Karl G. Maeser, and entered the High School building by the front door. It is nearly thirty years since the High School building was erected. At the time it was built, it was the pride of the entire state, for it marked the beginning of a new era in school buildings. Those who thought its capacity limitless were surprised to find that six years had scarcely passed when the institution began to agitate for another building. In less than a month, Senator [Reed] Smoot obtained money enough to erect the building containing our chief school auditorium, College Hall. The Alumni Association, under the leadership of Professor Edwin S. Hinckley, contributed the money that purchased the heating plant and the furniture. 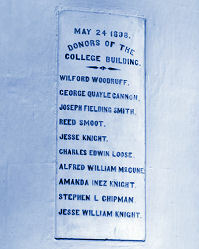 The white marble slab in the hall bearing the date, May 24, 1898, has the names of the donors to the building. Since that time six buildings have been added, the most important of which is the Maeser Memorial, erected to the sainted memory of Dr. Karl G. Maeser. Three of the group of eight buildings, now comprising the High School and University plant, would have been impossible but for the generosity of Uncle Jesse Knight and family. The beautiful campus on Temple Hill, of thirty-eight acres, partly donated and partly purchased, is one of the most valued acquisitions of the institution. In the field of student activities Brigham Young has had its greatest successes in basket-ball and debating. The pennants in the new trophy room are eloquent witnesses of the fact that for many years we have been State champions in basket-ball. It is just ten years since Brigham Young University began debating with teams outside the state. In that period of time we have lost only one debate to outside teams. It was also in the year 1910 that we met on the track Stanford University; the only time we have had an out-of-state track meet. This year the students have built a foot-path to the Maeser Memorial and are at this time collecting money to pay for a moving-picture machine. In this respect, they are but following the students who before them have dug trenches, paved walks, purchased and planted trees, founded libraries, furnished a gymnasium and bought tracts of land for the Temple Hill campus. Although the students who have marched under the banner of the White and Blue number thousands, and the persons who have served on the faculty number hundreds, three presidents have directed its destinies. These men are Dr. Karl G. Maeser, Dr. Benjamin Cluff, and Dr. George H. Brimhall. The supreme test of any institution is its output. This may be called the acid test. When put to this test, the Brigham Young High School and Brigham Young University feel just pride in their history of forty-five years. It is not possible to include names in an article of this length; suffice it to say that in practically every line of worthy endeavor and notable achievement the names of its graduates and former students are written high on the roll of honor.